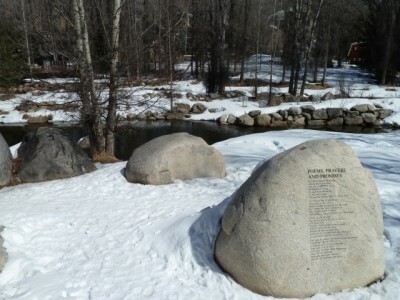 The channel dug along the Roaring Fork River by the city of Aspen in 1992 for flood control and as a "kayak park." See also, an aerial view. A highly regarded expert on rivers who has worked for both Pitkin County and the city of Aspen has recommended that a channel dug by the city in 1992 as a kayak course along the John Denver Sanctuary be filled in because it is harming the ecosystem in the Roaring Fork River. The main issue, according to Miller, is that the kayak channel diverts too much water during low-flow months, thus compromising fish habitat. 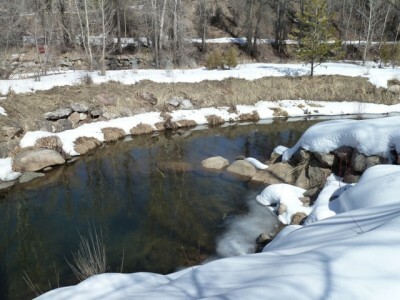 Miller prepared a study of the condition of the Roaring Fork River in 2011 along with Ayres Associates Inc. 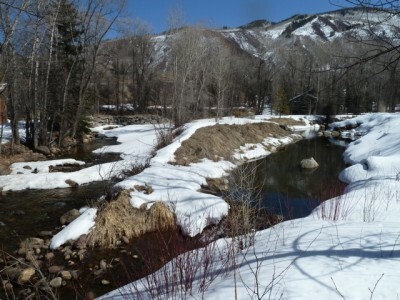 The study, called a “Geomorphic Assessment of the Stability of the Roaring Fork River Through the City of Aspen, Pitkin County, Colorado,” was done at the behest of the Pitkin County Healthy Rivers and Streams Board. The study was an extension of similar work done by Miller for the county on the North Star section of the Roaring Fork east of Aspen. Another problem, according to Miller, is that during high water, the water in the kayak channel erodes dirt from the banks and leaves it in the seven man-made pools in the 675-foot-long channel, thus reducing their viability as quality river habitat. Still another problem is that the small boulder dams in between the pools “create an obstruction to fish passage during low flows” and fish can get trapped in the pools. “The sediment and organic material deposition in the pools, the limited habitat, and potential summer heating of the water in the pools can be detrimental to any fish stranded in the kayak channel during the summer months,” Miller wrote. Miller also said that when warm water from the pools drains back into the main channel, it’s unhealthy for the river ecosystem. In all, Miller would like to see the kayak course replaced by a more river-friendly, low-lying riparian area. Miller identified a number of other structures and man-made efforts to control the river that are also having a potentially negative impact on the river, especially at low flows. There are also a number of locations where small rock structures have been placed in the river to help protect utility pipelines that cross the stream. Those structures are just high enough to make it difficult for fish to freely move about in low water, and they also cause very shallow areas to form upstream of the structures. Additionally, the banks of the river in many spots through town have been fortified with boulders by property owners to prevent flooding, which is not ecologically healthy for the river. While Miller’s study, completed in February 2011, is posted on the river board’s website — www.pitkincountyrivers.com — and was given by Miller to David Hornbacher, the city’s director of utilities and environmental initiatives, it has not gotten much attention until now. “We need to look at this report openly and have a dialogue with the county and determine the best approach moving forward,” Hornbacher said this week when asked about the report. The channel was dug by the city in 1992 to improve the aesthetics of the Rio Grande Park area. Prior to that, the city used the land along the river to dump snow cleared from city streets. And the city once disposed of large chunks of concrete there. The kayak course was also dug out in an effort to reduce the prospect of flooding at the Aspen Art Museum building. Now at high water, the kayak channel directs about a third of the river’s flow to the inside corner of a bend in the river, thus reducing the amount of water that rushes directly toward the museum building. While it is called a “kayak park” and a “whitewater course,” the channel has rarely been used. It does not create the kind of surfable waves that modern kayak parks are based on, nor is that stretch of the river popular with either kayakers or rafters so it is not a fun play feature in the middle of a run. 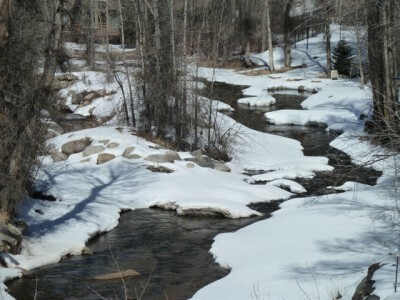 Along the way, however, the city needed to sign stipulations with the Colorado Water Conservation Board, the state water engineer and Trout Unlimited that it would leave 32 cfs in the main stem of the Roaring Fork. The city diverts water into the kayak channel by virtue of an imprecise rock weir, so the stipulations hold the city to diverting no more than a third of the river when it reaches 48 cfs. Today, the series of pools in the channel are probably more highly valued as a burbling amenity in the John Denver Sanctuary, which it borders, than as a kayak park. 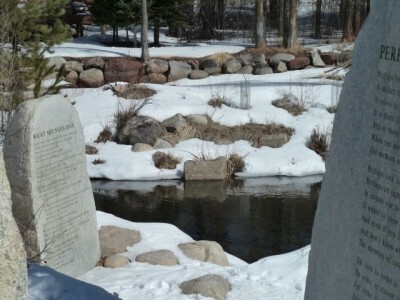 Stephen Ellsperman, the city’s director of parks and open space, said the flow of water in the channel by the John Denver Sanctuary is an important part of the park to many people. 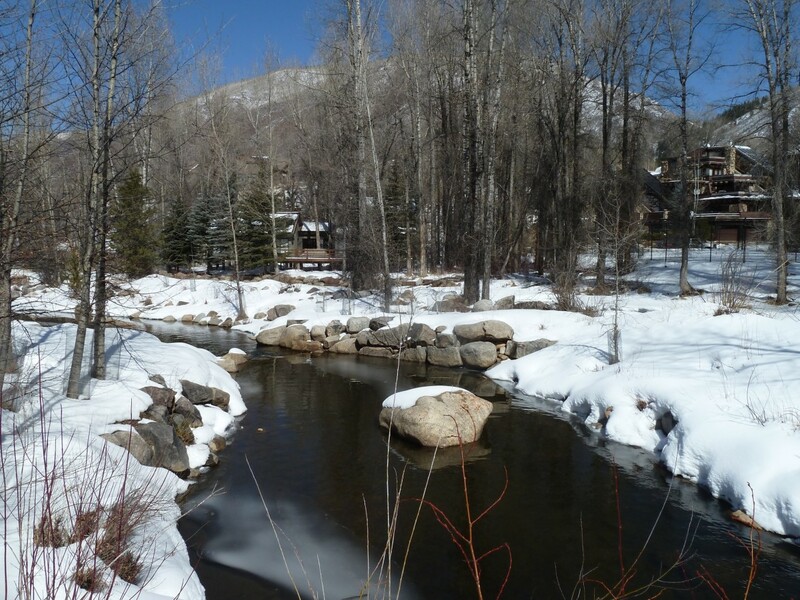 But he also noted the parks department has been working hard through other projects, such as the current stormwater management system being installed in the Rio Grande Park area, to improve the health of the Roaring Fork River. Jeff Woods, the manager of the city’s parks and recreation department, seconded that concept. Editor’s note: this story was also published in the Aspen Daily News on Thursday, March 8, 2012.